Manchester Evening News - Tuesday 15 September 1914. 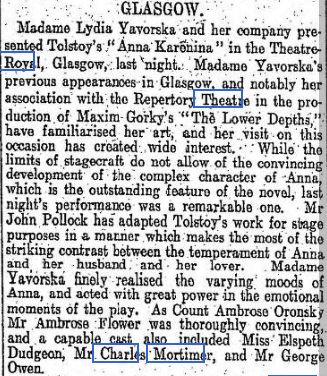 "Mr Ambrose Fowler's Vronsky, Mr W Edward Stirling's Cherbatsky and the Mr Karenina of Mr Charles Mortimer, are warmly welcomed." 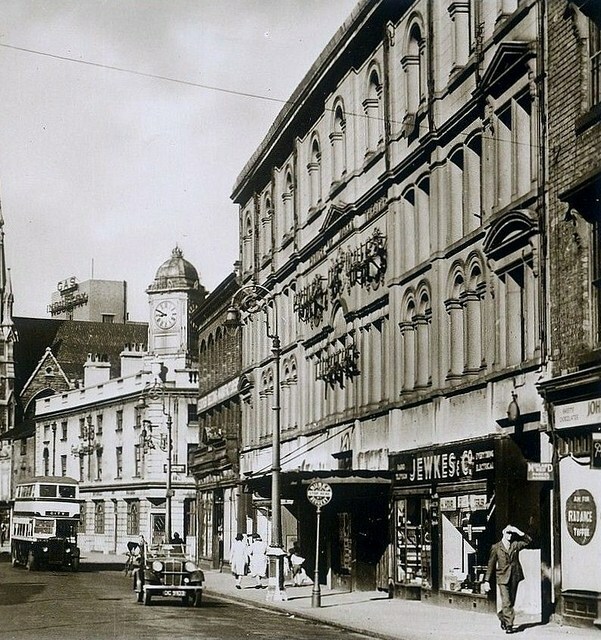 Birmingham Daily Post - Tuesday 13 October, 1914. Mme. Yavorska herself, despite her alien lilt, was always understood. Mr. Ambrose Flower had a little of the tenderness and the courtly reverence of Count Vronsky—his elder brother Alexander evidently belonged to a family of different breeding. A throng of minor Russian folk - excellent satirical sketches in the novel—pass in and out of the scenes —Mr. George Owen as Prince Stiva in an exaggerated but amusing comedy manner, Mr. Charles Mortimer as Karenin in the good old-fashioned and misguided heavy style, and Mr. Edward Stirling as Prince Cherbatsky. Miss Cholmondeky the Countess Lydia, and Miss Margaret Vaughan, charmingly simple as the girlish Kilty, were the best—most of the others were only the shady side of moderate. 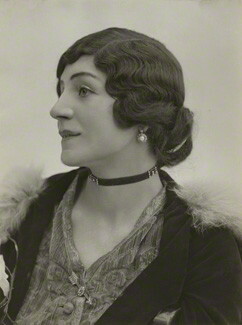 "Mr Charles Mortimer as the wronged husband, also played splendidly. He rose greatly to great occasions, and made a fine study of the husband whose love was turned to burning hatred." "Mr Charles.H.Mortimer furnishes a fine study of the wronged husband." 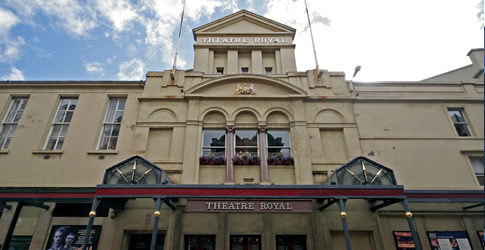 Theatre Royal, Newcastle upon Tyne. 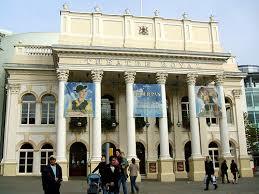 Interior of the Devonshire Park Theatre, Eastbourne. 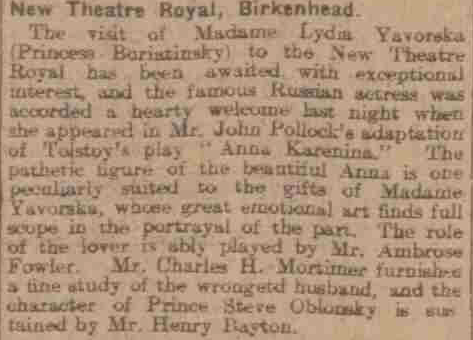 Taken from the Liverpool Echo of 17 November, 1914. Taken from the Manchester Evening News of 15 September,1914. 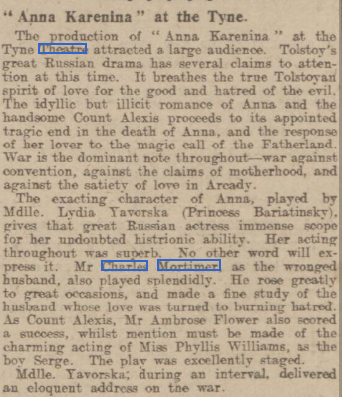 Taken from the Eastbourne Gazette of 16 December, 1914. 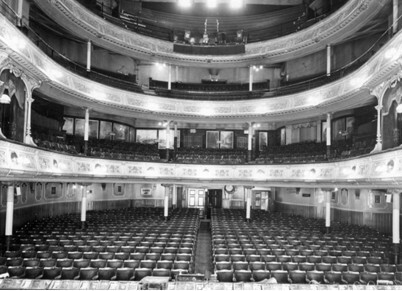 The interior of the Shakespeare Theatre, Liverpool. 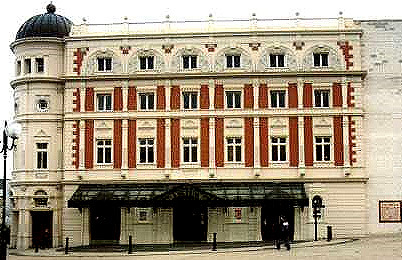 Prince of Wales Theatre, Birmingham. 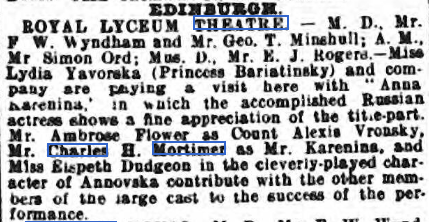 From the Newcastle Daily Journal of 27 October,1914. From the Birmingham Daily Post 13 October,1914. 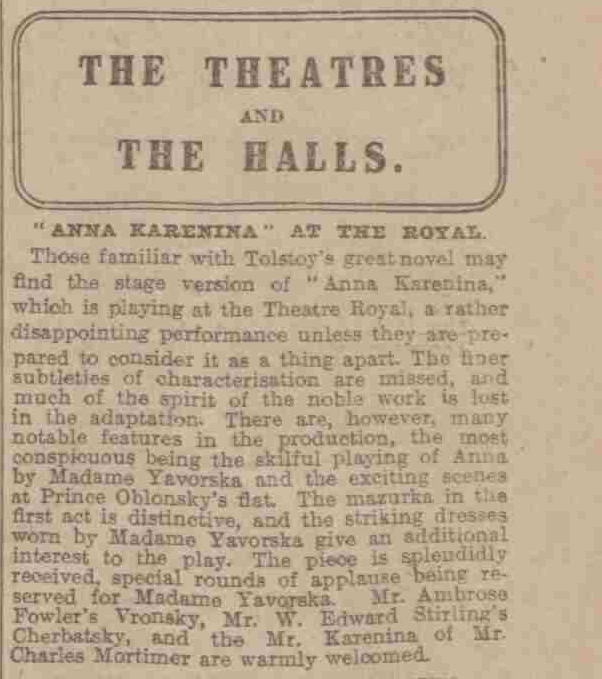 "Anna Karenina" played at the Ambassador's Theatre, London, from 1 December, 1913 until 8 April, 1914, and then went to the Scala from 13 April to 6 June, 1914.